﻿There is much enthusiasm for the path of ordination among the members of the Young Rite. An explanation for this enthusiasm lies in the somewhat different paradigm regarding the concept of priesthood. A priesthood we believe to better fit the times we live in. The ramifications of this paradigm shift are immense and are rightly viewed as radical. In the Young Rite we do not make distinction between congregation and sanctuary and all present are seen as clergy. This is the foundation upon which the concept of a universal and free priesthood is based: Everyone who desires to become a priest may request and receive the ordinations. The confusion arises, however, in that it is pertinently not so that everyone who receives the ordination to the priesthood in the Young Rite also may (or must) celebrate public services. The path towards the priesthood and the ordination itself are firstly meant to be an aid to be able to function more fully within society. The potential that is offered by the ordination is nothing more than exactly that: Potential. It is in daily life that this potential can be transformed into the active ingredients for and in the service of our fellow human beings. Here is in a nutshell what we see as one of the primary roles of the priest. The real work is not so much the celebration of the Eucharist on Sunday, but the radiating of positive, beneficent energies in the environment in which we find ourselves from day to day. The service on Sunday can be seen as a moment of experience, of learning, of practice, or a moment to recharge. Everyone is therefore able to tread the path towards the priesthood in the Young Rite, even without fulfilling any ceremonial role whatsoever. The person who does fulfill this ceremonial functioning as priest we no longer call a priest, but a celebrant. For those who have received the ordination to the priesthood within the Young Rite and also desire to celebrate its public services, other considerations -as mentioned below- are taken into account. To sum up: Everyone who wants to tread the path of ordination may do so, without the necessity to function in a ceremonial capacity. This means that the profound apostolic developmental path is open to all and is not reserved for the chosen few representatives of the church. Everyone carries their own responsibility and we are convinced that humanity is ready to take this new responsibility. True spirituality in our view cannot really exist without this own responsibility. In the Young Rite ordinations are conferred on everyone, men as well as women, requesting such ordination.This means that in principle every man or woman is in a position to be ordained to the priesthood, if they so desire. Every person who has received the ordination to the priesthood is able to celebrate the Holy Eucharist and is encouraged to do so privately, in their own home, as frequently as they may deem fit. However, the ordination to the priesthood does not automatically mean that such person may celebrate at public services of the Young Rite. Some will have this ambition, others not. For those who do not, no further formalization is required: They may confer all priestly sacraments as and when they wish within their personal home environment. Note, there is no obligation, only the possibility. However, when celebrating at a public service, the celebrant is no longer acting on own title but as a representative of the Young Rite. It is self-evident that certain standards may be expected and upheld by those executing the public celebrations of the Young Rite. The aspirant is able to demonstrate ample skill in the execution and thorough knowledge of the mechanical movements in the celebration of the Traditional Form of the Holy Eucharist. The bishop will be present at a celebration and convinces himself or herself that the aspirant performs these movements correctly, in a flowing, supple and fitting ceremonial manner. The aspirant will demonstrate sufficient experience with the liturgy and missal and be able to recite (and preferably also sing) the liturgy clearly and with appropriate feeling. Furthermore, skill in performing the functions of subdeacon and deacon during the celebration of a High Mass will be amply shown. The quality of the outward movements is in itself not sufficient for a public celebration. Our public services are the first impression and someone who is interested enough by our way of thinking to make the effort to attend a service should not leave disillusioned by a mediocre service. 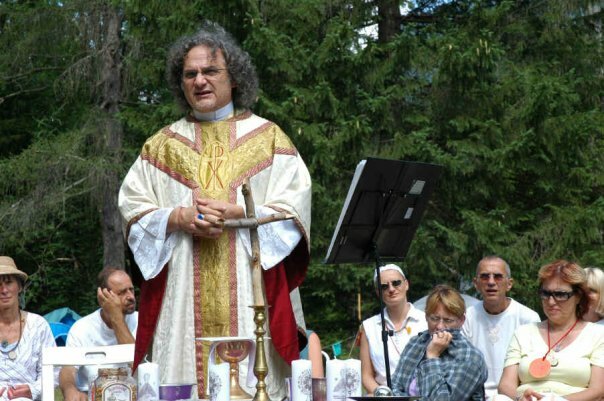 Experiencing the power flowing through the celebration of the Holy Eucharist is subjective and everyone has a good day and a less good day, yet the bishop will need to conclude that the intention of the celebrant is directed in such a way that an uplifting service results. In cases of doubt the bishop will suggest a few months of extra practice in the personal environment before reapplying for an authorization. As a celebrant your position is one of service to the circle, in whose name you are functioning as celebrant. It is not important -more so, it is irritating for those present- to display how well you perform or how well you did something, what your accomplishments are in life or in spiritual work, or the (spiritual) powers you may possess. As a celebrant you are genuinely interested in the welfare of others -hence you serve them by celebrating- and a healthy dose of modesty is called for. Merely counting how frequently a person uses the word “I” during a conversation already provides an indication as to the distance someone takes. The Young Rites operates within the esoteric Christian tradition. This means that we are hardly concerned with the historic person of Jesus of Nazareth, but concentrate on the inner teaching as demonstrated in the Christ life and given to us via the scriptures. As the profoundest of this teaching is the practice of love, we search for the responsibility and authority within ourselves and not in the gratuitous following of rules, belief in dogmas and praising of gurus. Only the individual is able to color his or her actions with love. Aspirants recognize that the true conferror of the sacraments is none other than Christ and are pertinently aware of the magical operation of their effort. An individual acting on behalf of the Young Rite, speaks and acts in a respectable manner and does not bring the Young Rite into discredit. Even though we do not see it as our duty to make moral judgments, we nonetheless do expect that celebrants hold themselves to the laws of the country and are persons of integrity. Furthermore, seeing as celebrants are expected to vest when celebrating the Holy Eucharist, they should be in possession of or have access to the required vestments.